I have been having trouble swallowing liquids for about a year. It was never anything serious. I would sometimes cough after swallowing drinks. But then, I began coughing vigorously. I was choking on everything I swallowed. Then one day while taking one of my many pills, I choked on a capsule. This time I couldn’t clear my throat. I couldn’t speak. My husband was in another room so I began banging on the dresser with my hand. Luckily he heard me and was able to help clear my throat of the pill. This really scared me. I thought I was going to die. I called my neurologist and told him about it. He explained that lesions might have damaged my nerves as well as the area of the brain responsible for coordinating swallowing. He suggested I see a speech therapist. Days later, after hearing my story, the speech therapist seemed very concerned. She explain, when swallowing difficulties are present, food or liquids that you eat may be inhaled into the windpipe instead of going down the esophagus and into the stomach. And once in the lungs, the inhaled food or liquids can cause pneumonia. She thought this might have been happening to me, so she set up a swallow exam. 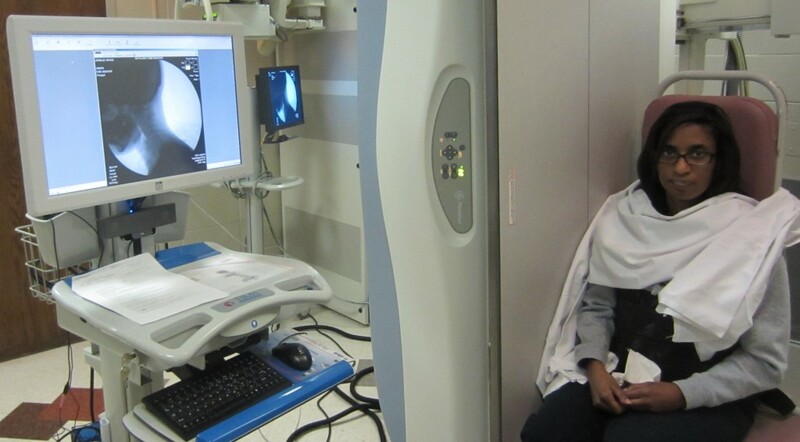 The swallow test involves a radiologist watching an X-rayed esophagus so they can document any noticeable swallowing difficulties. They fed me food and drinks and X-rayed my throat as I swallowed. It wasn’t some great meal either. The food and drink had a substance called barium in it. 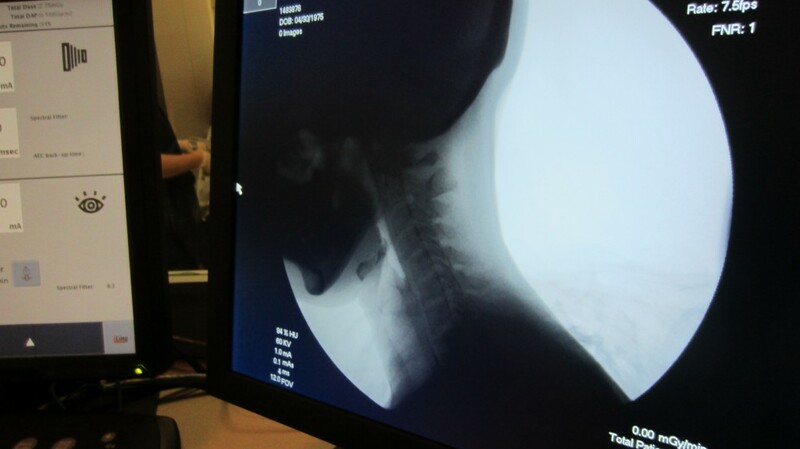 The barium coats the esophagus enabling the hollow structure to be seen on the X-ray. 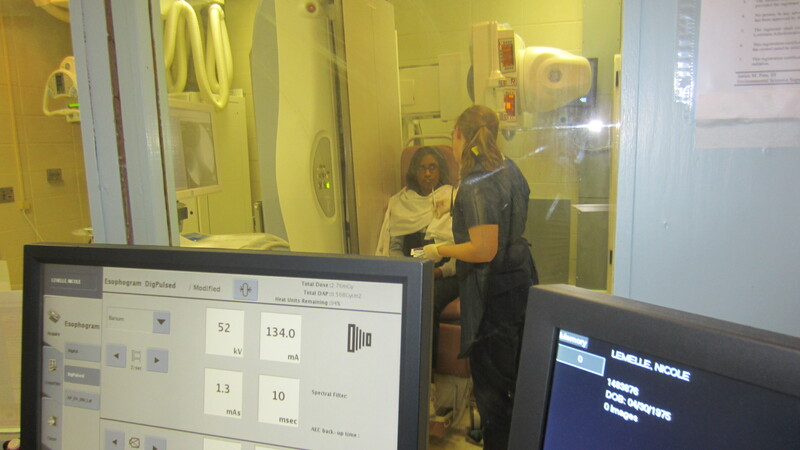 Oh, by the way, the barium tasted terrible. Next, they captured a series of X-rays to visualize the pathway the barium took to get to my stomach. Start to finish; the test was about an hour long. After seeing the results, my doctor and speech therapist confirmed I was having problems swallowing thin liquids. Because of this, I have an increased risk of catching pneumonia. The suggested plan of action is to thicken my liquids to a nectar consistency. Also, substitute thin liquids with thicker liquid choices such as cream soups for plain broths. And when taking medication, crush pills and mix them with applesauce or pudding. I bought the suggested thickening agents and I’m supposed to use it with all liquids. Has anyone else experienced swallowing problems? I’ve shared this choking incidences with my physical therapist, as it is quite frightening, choking and unable to breathe. I’ve kept it to myself because I just don’t want anymore tests and meds. And to worry anyone and I also don’t drive anymore and hate bothering and asking for rides. My PT put in an order (with my permission) to my neuro for speech therapy. I tend to panic which makes it worse. This doesn’t happen often, but it is the most frightening thing I’ve ever experienced. It’s so frightening that I wouldn’t even want this test for fear of choking,being unable to breathe. I’ve taught myself to be so aware of everything I put in my mouth and slow down. There are now certain things I completely avoid. Jill, I hope so too! Just two more cents…I choke/gag at times when I drink hot liquids. At times I choke in my sleep but that is reflux which a GI doc told me years ago can be MS related. The hot liquids are okay but if a lesion is active in the swallow part of the brain – I think it is a mid-brain issue – then the choking happens. I hope you do not have to go through any more testing – sounds painful and unpleasant. Elaine, the test wasn’t bad at all! I have had swallowing problems and have ignored them, as several of you did at first. I also have increasingly scratchy throat from reflux that I can’t seem to kick. But I’ve ignored that because I have gastroparesis, a word for severely slow digestion, which can cause reflux. In the last year, I have had a number of episodes where I was alone and got panicky – I could no way get the coughing stopped from water in the windpipe. Since they use nasty stuff for these tests – I’m so sorry Nicole, but good that you got it done – I wish they would have checked swallowing when they did the testing for digestion. Does anyone else have slow digestion? Or reflux with their swallowing issues? The gastro condition is caused by a cranial nerve that should have nothing to do with MS, but if you check MS sites, sure seems a lot of us are affected by it. In any event, looks like we need to be careful with liquids and eating. Thanks everyone for your experiences. Thank you for Tuesdays with Nicole. Sue, I have gastroparesis too! Reglan helps a lot. Sue D, mine was brought on by over using laxatives. Nicole, I just saw your reply about laxatives. You know, I asked them specifically about that and they told me no, wouldn’t be that! I have been using laxatives for years – no other way to cope. I had my suspicions, too. A cranial nerve problem wouldn’t seem MS-y. Thanks!! Thinking of you, Nicole, and praying for a good result on your swallowing issues. I don’t like swallowing capsules either. I don’t like icy drinks and prefer room temperature. Roberta, thanks so far so good! I on the other hand love icy drinks! I have difficulties with spicy foods, when they touch an area at the back right side of my tongue, it sets off coughing & choking, it is VERY scary…..and very hard to explain, my Neuro hadn’t said whether it was caused from radiation damage after my gamma knife to the Trigeminal Nerve in the center of the brain or a lesion. We have discussed a swallowing test, maybe I should follow through with it? Amy, that’s interesting. I guess the swallow test won’t hurt! Hello. Yes, this is something I have very recently begun to experience and it is difficult to deal with. I find it’s worse when I’m in bed, you know, when you need to just swallow. I thought I was going to choke when it first happened. Rachel, oh! eating or drinking in the bed is forbidden! Propping your head up a bit with pillows will help with that swallow/choking problem. It may be a good idea to consult with an OT regarding adaptive techniques, preferable to pills, to prevent the choking. It is all so unpredictable – choking with a mouthful of liquid is the worst. I become a geyser for a moment – and then, (groan), the clean-up reminds me I also have back problems. Breathing correcting also affects the swallow/choke effect. If you have an apnea condition, it may be a good idea to get a sleep study. Around here they hold sleep study’s at the Marriott. The hospital has a contract with the Marriott. The hospital is one of those non-profit hospitals worth billions. Hmmmm. ProPublica has a good piece on non-profits or ‘non-profits’! The swallow test that I had was actually for my scleroderma, it was terrible. I never realized that MS could affect the throat like this. I cough after drinking cold liquids all the time. All I do is drink warm ones, and eat popsicles when it is warm out. I’ve only ever mentioned it to my pulmonologist. No one seemed concerned. Once I did almost choke to death, but it was as if – my throat forgot what it was meant to do. Thank You so much for sharing your experience with us. Always learning. Max, I’m lucky, they immediately sent me for the test. I have the gagging off and on though like you, I have always recovered even if I cough a long time to clear things up. Smoothies with banana, maybe not cream filled soups because of cholesterol, but soups thickened with beans or lentils. I have a great Cauliflower soup that uses lentils. 2 med. onions, about a cup or more of chopped carrot, stir until onions are clear, add a bit of salt and pepper. In another pan brown to your taste some ham or bacon – not too much – and set aside. Add about 4 cups of water to carrots and onions, (I also add some ‘Better than Broth chicken broth concentrate to make the soup great), Bring to a boil then add lentils, cauliflower florets (1 head), and bacon and simmer until lentils are finished cooking. Then serve with crusty bread and put some Parmesan on top of the soup. Yum! I cook this and then do not have to cook for a few days! This is a Lydia from PBS TV recipe. Just a suggestion – does anyone have any others? Elaine, thanks! didn’t think I would get the recipes out of this! Why not? Sharing is good! Vivian, my honesty is a prerequisite for the site! thanks for reading. Hi Nicole, my late wife had PMS she also had difficulty swallowing and on July 4th she had a peg feed tube inserted into her stomach as liquids and food was going into her lungs. Vicki didn’t like the thickening agent even with cranberry juice, but time came for all liquid, food and medicine to be put through the peg. What people forget is that everyone produces about 1.5 litre’s of saliva a day, normally this is swallowed or spat out, so please do be careful. Take care. David, my condolences. thanks for stopping by. Thank you for sharing the information about your late wife. I also am sorry for her loss. I am sure she taught many even though infirm. – for some reason hot, cold or carbonated liquids work best. The added stimuli seems to work for me. I love milkshakes. I would have lost more than 13lbs without them. – practice singing and/or moving your tongue around your mouth. Yoodle if you dare. On the thickening things up, my wife and I use crushed crackers to thicken up food for our youngest who was aspirating her food and is slowly being weened off her g-tube. Saltines and Ritz work well crushed, and they are cheaper than the medical supply stuff. Good luck, and I hope you feel better. 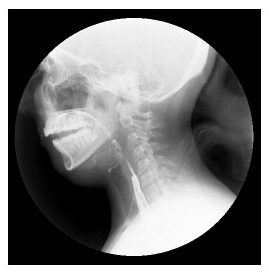 Swallowing problems are one of the MS complications which can be life threatening. They were even listed as one of the causes of death in the recent study of MS patients 21 years after diagnosis. The study looked at the impact of delaying the use of DMDs 3 to 5 years, and it was scary to read. Swallowing issues are no joke. Take care. Geof,Of course I remember you and your children! of seeing you around Cohen’s blog too! I’m dealing with the following issues. YES!!!!! 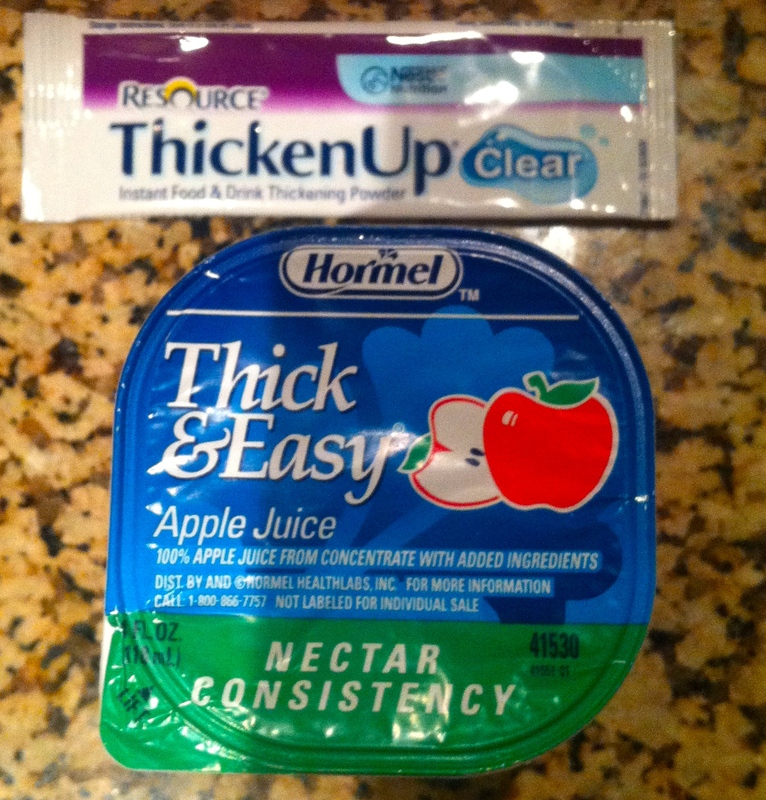 The thickening substance needs to be added to all thin liquids for example your morning cup of coffee. Also question your pharmacist for any possible substitutions for any liquid meds you may take. We don’t want you to develop aspiration pneumonia. BTW, I am a speech therapist with MS as an added bonus. Mary Alice, you remind me of my speech therapist sister-in-law! Nicole i wish so much something really positive would happen for you. i wish i could help you but sadly i am more or less in the same position. Damm MS! What a frightening experience. I am glad that you saw a specialist to help but so sad that this is part of your life now. I really hope the thickening agents help you. Thank you for sharing your stories. MS effects people is so many different ways and I was not even aware that this could even be one of the effects. You are so strong and beautiful. Thank you again. Sue, you’ll get a first-hand view Thursday! I had my first swallowing test last year — I’m supposed to eat mechanically-separated foods and nectar-like liquids, but I haven’t been able to afford to do only specifically that. Thank god I’ve been lucky enough to avoid pneumonia! So far, so good — I try to be actively mindful of every bite now in a way that would’ve helped me a lot when I was trying to lose weight all those years! I would love to hear more about dietary changes you’ll be making for this because I know I need to do the same, but seeing someone else’s journey will help me (and many others I suppose) on this leg of the journey. I also have MS – have had swallowing problems for about 3 or 4 years now. Have also had a Barium swallow test. Had first session with a speech therapist 6 weeks ago to try and improve. Was given some exercises to do, which have helped but not resolved. Have a follow up session with therapist tomorrow. Gary, thanks for writing. yes the exercises to help. Not had swallowing problems as bad as yours. I have been getting by using exercises a speech therapist taught my daughter some 30 years ago. She was born with an oesophagial Asteria ( her oesophagus didn’t join up to anything and bits were missing …the charity which supports these children have “babies born unable to swallow” as their motto. Truly frightening times for any of us, glad thickeners have helped. Barium meals are gross, I wonder now how as a 3 year old she drank the stuff…..
Hope you find this a long term solution. Jill, I’m sorry to hear about your daughter. I hope they find a long-term solution as well!